This is entry #50 in Amy Johnson Crow’s Challenge: 52 Ancestors in 52 Weeks. And the countdown continues. Two more to go! The late Madison Lockhart “Matt” Claunch of Brownsville, Texas, and Ralph L. Hayes of Alamo, Texas, are to be credited with the work done so far to connect Hieronymus GLANTZ (a.k.a. Jeremiah CLAUNCH) to my 4th great-grandfather Dennis CLAUNCH (a.k.a. Dennis CLONCH). Matt Claunch, in his 1985 manuscript The Family of MADISON LOVE CLAUNCH, SR., and Ralph Hayes used tithe lists, tax rolls and lists, levies, land records and surveys, debt collections, ordinary licenses, and court records. The surname spellings in these records varied: Glantz, Clonch, Claunch, Clansh, Clanch, Clounch. The immigrant Hieronymus GLANTZ came to America in 1732 with his wife, a daughter and a son. On the ship list he was seen as Jerimy GLANCE age 29, his wife as Marrea Medl GLANCE age 30, his daugher as Anna Margreate GLANCE age 9 and Hance Michalle GLANCE age 4. He signed the Oath of Allegiance with the name he had used in the old country, not the name seen on the ship list. His wife died soon after their arrival and Hieronymus married Erna Barbara MACK on 15 October 1733 in Philadelphia, Pennsylvania. It is very likely that Jeremiah and his bride Barbara knew each other from the old country. Her father Georg Michael MACK arrived in America on the Adventure, the same ship as Jeremiah, on 23 September 1732. Barbara arrived 10 days earlier on 13 September 1732 on the Pennsylvania Merchant. In 1750 through 1752 George MACK was seen in the household of his son-in-law Jeremiah CLAUNCH in Lunenburg County, Virginia. Hieronymus GLANTZ was known as Jeremiah CLAUNCH once he settled in Lunenburg County, Virginia. He may have married again as he is seen with a wife named Margaret in 1748 and 1758. Since his father-in-law was seen with him in 1750-1752 it is also possible that Erna Barbara used a different name (Margaret) once she came to America. Please remember that this is pure speculation on my part. Jeremiah may have had sons or grandsons named Jeremiah Jr., Edmund, Jacob, John, and Barnet/Barnaby. These names were found at the same time on the tax lists of Montgomery and Wythe counties. Jeremiah CLAUNCH Jr. seen in Montgomery and Wythe from 1783-1793 (and even later in Grayson – all due to the changing county lines) cannot be the Jeremiah CLAUNCH who was seen in Mecklenburg County, Virginia, from 1783 to 1799. Note that the use of Jr. was seen in the records and does not necessarily indicate that Jeremiah Jr. was the son of Jeremiah Sr. Conclusion: The correct relationship to the immigrant is not known. Sorry folks! If the records do not turn up, DNA testing may have to be done. In 1783 Jeremiah CLAUNCH bought 60 acres of land from Joseph and Ann DECKER on North prong of Eastlands Branch in Mecklenburg County, Virginia [1, 2] and was seen twice that year on the county poll. There was no standard form and tax collectors had to drawn up their own forms with column headings: Name of individual charged with tax; Quantity of land; Rate of land per acre; Value of land; Amount of tax. In the above Jeremiah was seen alone on the tax lists in the earlier years and then sons’ names were included as they reached the age of 16. Records between for 1791 to 1793 are not included above. This would be the period when son William may have shown up with Jeremiah. The order of birth of the sons was most likely: William, Matthew, Dennis, and Jacob. Following the date and name of person taxable, the first column was the number of white male tithables over 16, 2nd column was the number of slaves above 16, 3rd column was number of slaves 12 to 16, and 4th column was horses, mares, colts and mules. Although William was not found on the tax lists mentioned above, this marriage shows that he was the son of Jeremiah. He was not on the 1794 tax list. Could this mean that he moved to Mercer County, Kentucky following his marriage in 1793? “Jeremh Clanch” was security at marriage of Peter Jones and Sarah Jackson on 11 December 1797 in Mecklenburg County, Virginia. Jeremiah CLAUNCH married Prudence JACKSON on 21 March 1799 with Sam’l ALLGOOD as security in Mecklenburg County, Virginia. Prudence was most likely the sister of Sarah Jackson as both of these ladies were later mentioned in a chancery record concerning the land of Henry and Ann Jackson. At first I thought that this marriage was for a son of Jeremiah. After studying the limited amount of tax records and the earliest census records I have come to the conclusion that Jeremiah who married Prudence must be the same person as Jeremiah seen on the tax lists above. This would mean that Jeremiah, father of William, Matthew, Dennis, and Jacob was widowed before 1799. Matthew CLAUNCH married Elizabeth ALLGOOD on 29 August 1799 (Sam’l ALLGOOD, security) in Mecklenburg County, Virginia. Father Jeremiah was on the same tax list with their brother Jacob who was not yet 21 years of age in 1799. From the tax records we know that Jeremiah was still living in 1799. His oldest son William was widowed and remarried in 1798 in Mercer County, Kentucky. This gives us a 1793-1798 window for his move to Kentucky which I believe can be narrowed to 1793-1794 as William was not seen in Mecklenburg tax lists. According to information supplied by Ralph L. Hayes, Jeremiah CLAUNCH sold livestock and household goods in Mecklenburg County in 1800. Was he preparing to move? Family tradition is that William, Matthew, and Jacob moved to Mercer County, Kentucky, in the late 1790’s – tax lists prove this wrong in the case of Matthew and Jacob! They left only after 1799. Let’s see what’s going on in Mecklenburg County after 1800. Dennis CLAUNCH and Nancy BEASLY were married 8 November 1803 (William JUSTICE as security) in Mecklenburg County, Virginia. Sally CLAUNCH married Allen CHAVOUS on 7 September 1804 (Drury JOHNSON, security) in Mecklenburg County, Virginia. Jinny CLAUNCH married Samuel ALLGOOD on 29 December 1804 (Matthew CLAUNCH, security) in Mecklenburg County, Virginia. There is no mention of their father Jeremiah in these marriage records. However we do see that Matthew was still in the area in December 1804 as he was security for his sister Jinny’s marriage. If he moved to Kentucky with his brother Jacob then the move took place in 1805 or early 1806 as we see Jacob CLAUNCH marrying Mary “Polly” GRAY on 26 June 1806 in Mercer County, Kentucky. Their sister Jinny and her husband Samuel ALLGOOD moved to Henderson County, Kentucky, sometime after their marriage and before 1820. There is no 1810 census for Kentucky. My 4th great-grandfather Dennis CLAUNCH was seen on the 1800, 1804, and 1805 tax lists of Mecklenburg County, Virginia. This means that he most likely moved from Mecklenburg County to Kanawha County in 1805-1806. This is the same time period as Jacob and Matthew’s move to Kentucky. Did they travel part of the way together? I have one last record that I believe belongs to this family group. 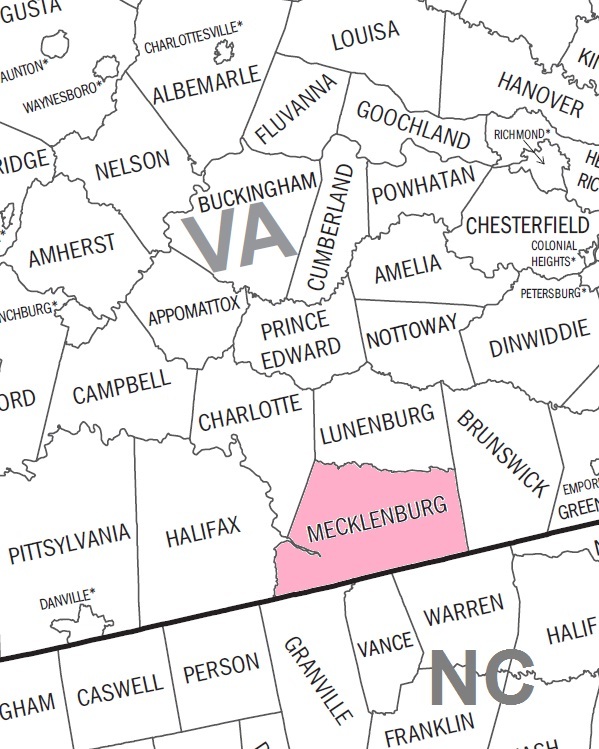 About 1791 a boy named Jeremiah CLAUNCH was born in Mecklenburg County. This was before any of Jeremiah’s sons married therefore I believe that he may have been a son of Jeremiah – and his youngest child if he did not have children with Prudence. Many of Jeremiah CLAUNCH’s children were born during the American Revolutionary War (19 Apr 1775-14 Jan 1784). Assuming that Jeremiah was 21 years of age when his oldest child was born, I estimate his birth at 1752 or earlier. William CLAUNCH (1773-aft 1820) abt. 1773. William married(1) Betsy ALVIS on 5 August 1793 in Mecklenburg County, Virginia. He married(2) Rebecca BOTTOM on 14 June 1798 in Mercer County, Kentucky. Matthew CLAUNCH (1776-1846) born about 1776. Matthew married(1) Elizabeth ALLGOOD on 29 August 1799 in Mecklenburg County, Virginia. He married(2) Mahala NICHOLS (1812- ) on 3 March 1843 in Mercer County, Kentucky. Mahala was 21 years of age. He died in 1846 in Mercer County, Kentucky. Dennis CLAUNCH (1779-aft. 1810) born about 1779. Dennis married Nancy BEASLEY on 8 November 1803 in Mecklenburg County, Virginia. He died after 1810. Jacob CLAUNCH (1782-1843) born about 1782. Jacob married Mary “Polly” GRAY on 26 June 1806 in Mercer County, Kentucky. He died before 1843 in Mercer County, Kentucky. Sally CLAUNCH (1785- ) born about 1785*. Sally married Allen CHAVOUS on 7 September 1804 in Mecklenburg County, Virginia. *No further information found. Estimated that she was close to 18 when she married. Jinny CLAUNCH (1785- ) born about 1785*. Jinny married Samuel ALLGOOD on 29 December 1804 in Mecklenburg County, Virginia. *In the 1820 through 1840 census she was consistently seen in an age group which fits into the between 1780-1790 area. Assuming she was close to 18 when she married would put her closer to born between 1780-1786. Jeremiah CLAUNCH (1791-?) born about 1791 in Mecklenburg County, Virginia. He served during the War of 1812. No further information found. Dennis is said to have been on the 1806 and 1809 tax list of Kanawha County. Years ago I requested a lookup of these lists but did not receive any replies. In 1810 Dennis and his wife had three children under the age of 10 in their household, a boy and two girls. Note: Dennis first showed up on the tax lists with his father in 1796 which would mean that he was over 16 at the time putting his year of birth at abt. 1779. By 1799 he was seen alone on the tax list which normally would mean that he was at least 21 putting his year of birth at abt. 1778. The age range for 1810 puts his birth at 1784 or earlier. Dennis most likely was born between 1778-1780, I’ll pick the middle value and say he was born about 1779. As Dennis was in Kanawha in 1810 this would mean that he moved his family to Mason County following the census and before his death OR his widow Nancy moved to Mason County following his death as she was the head of a household in Mason in 1820. My 4th great-grandfather Dennis CLONCH died between 1811-1820. There is no family tradition concerning his death and no death record was found. You might ask why I call my 4th great-grandfather Dennis CLONCH and not Dennis CLAUNCH as he was seen in all records except the 1810 census where his name was spelled CLOUNCH? I’ll tell you that story next week. Stratton Nottingham, comp., The Marriage License Bonds of Mecklenburg County, Virginia from 1765 to1810, Onancock, VA, USA, 1928 (online http://books.google.lu/ : accessed 7 Dec 2014), pgs. 1, 9, 10, and 29. Ancestry.com. U.S. Army, Register of Enlistments, 1798-1914 [database on-line]. Provo, UT, USA: Ancestry.com Operations Inc, 2007. 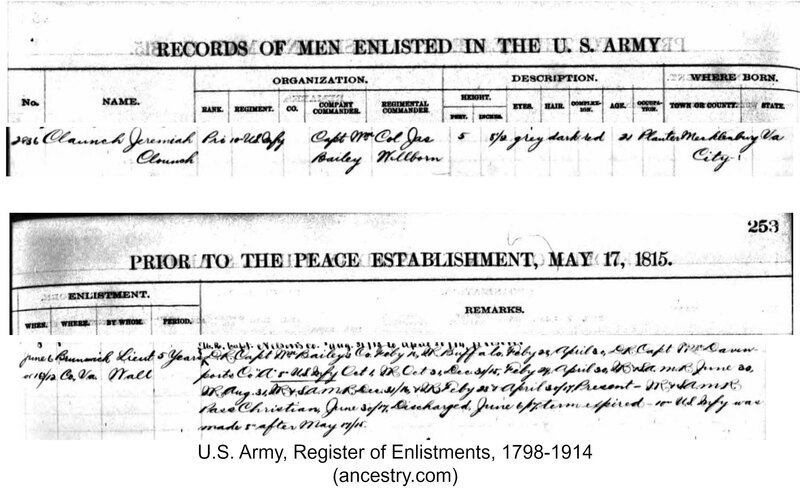 Original data: Register of Enlistments in the U.S. Army, 1798-1914; (National Archives Microfilm Publication M233, 81 rolls); Records of the Adjutant General’s Office, 1780’s-1917, Record Group 94; National Archives, Washington, D.C.
Aren’t those personal property tax lists wonderful? You’ve found an amazing amount of documentation for that time period in an area that is notorious for burned counties. Great work! Thank you Linda! Yes they are! I can’t take the credit for all the tax lists found and I believe in sharing and giving credit where credit is due. There are more records to discover, it’s getting access which is more difficult. Virginia is making it so easy, though, with the great work they are doing at the Library of VA. I am loving them for putting the Chancery Records online but do wish they would hurry up with a few of the counties that are still missing. I really need to learn my way around their site…..always seem to be going to the land grants and chancery and forget to check for other things. I’ll take a look at that. Thanks Linda. Thanks Ralph for stopping by. I so appreciate your sharing with me over a dozen years ago. Someone will find the missing documents that we need – one of these days!